FC Halifax Town manager Billy Heath has urged his players to “embrace” the occasion ahead of his side’s visit to Prenton Park to face Tranmere Rovers on Saturday. Both teams are struggling for form in the Vanarama National League with the Shaymen only winning once in their previous seven games in the division. Tranmere, meanwhile, have only won five of their 17 fixtures in the league and currently sit three places behind Town in 16th . The pair met in the FA Cup two weeks ago, with Micky Mellon’s men sealing a comfortable 3-1 victory at The Shay to set up a first round proper tie with League One outfit Peterborough United. Town are searching for their first win on their travels since a memorable 3-0 triumph at Leyton Orient in early September. Heath, who acknowledged that his players are suffering with a lack of confidence after the 2-0 home defeat at the hands of Maidstone United in midweek, is hoping for a similar outcome to the Orient game against another “massive football club” - in Birkenhead. He said: “The FA Cup tie was a poor game from our point of view against a very good Tranmere side. Hopefully it will be a different game against them on Saturday. “They are not having the best of times themselves, but it’s not my place to comment on them. They are a massive football club with some very good players. We all can’t wait to go there and we’ll be embracing it. “Why would you not want to go to Tranmere? It will be like when we went to Leyton Orient. That was a huge fixture for some of our players. A lot of our players haven’t played at this level before. “Every game is a big game but this will stand out for some of the players that they’re going to Tranmere Rovers. But we’ll all be going there to try and get the three points. “We’ve got to make sure that we pick something up from the game. The players need to put a big shift in. “The confidence is not a massive issue but we went on such a great run and suddenly it has come to a halt. “If you were given this position at the start of the season with these points on the board, the majority of people would have taken it. “But because we had such a great start everybody was suddenly looking at us to get here and get there. “But we’ve got to be realistic. Financially we can’t compete with the other teams in this league. 95 per cent of the teams in this league are paying a lot more money than us. That is the realism of what it is. “When we were in the play-off positions a few weeks ago I said that we are very mindful of what we are in this league. “ We have got to work hard in every game to get points on the board. Maybe things have waned a little bit but we just need to keep on working hard and try and get something from the Tranmere game. “We thought we would get a slight dip in performances at times throughout the season but the players have now got to roll their sleeves up and work as hard as they possibly can. One of the main factors of Town’s dismal run of form – in which they have only picked up six points from a possible last 21 in the league - is a distinct lack of goals. They have only netted three times in their last six competitive games, including an own goal from Rovers’ captain Steve McNulty and one from George Waring, who is on loan from the Prenton Park outfit and unavailable against his parent club. 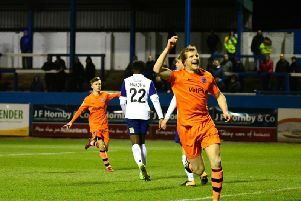 Heath is delighted to have joint-top scorer Tom Denton back after the former North Ferriby striker completed a three-match suspension following the straight red card he received in the 1-1 draw with Boreham Wood. “He has been a big loss and I am glad he is back,” Heath admitted. Town’s second choice goalkeeper Tommy Nicholson looks set to start again as Sam Johnson continues to recover from the back spasm he suffered at home, which kept him out of action in midweek. Nathan Hotte will also be unavailable for the trip to Merseyside as he will serve a one-match ban for picking up his fifth yellow card of the season against the Stones.